Across New York, State Parks staff is working hard to help support the diverse populations of pollinators from bees to butterflies, beetles, wasps, and more. Here’s a sample of the pollinator protection projects going on this year in State Parks. Staff is developing educational materials about the native pollinators who live in the recently restored sedge meadow. This wet meadow (with grass-like sedges) is habitat for several uncommon butterflies, including northern pearly eye (Enodia anthedon), Appalachian brown (Satyrodes appalachia), mulberry wing (Poanes massasoit) and black dash (Euphyes vestris). However, the size of the habitat at the John Jay State Historic site has declined because woody plants and non-native invasives such as multiflora rose and Oriental bittersweet started growing in the meadow. Woody shrubs have been removed to set back succession and restore the sedge meadow habitat. The outreach materials will explain the restoration and highlight some of the flora and pollinators that visitors may see at the park. The northern pearly eye (Enodia anthedon) is one of the many butterflies that occurs in the sedge meadow habitat at John Jay State Historic Site. Photo credit: Matt Schlesinger, NYNHP. State Parks biologists and environmental educators are establishing and enhancing native plantings and habitat in seven state parks throughout Long Island. Look for these pollinator projects in Orient Beach State Park, Heckscher State Park, Bethpage State Park, Robert Moses State Park, Caleb Smith State Park, Connetquot State Park Preserve, and Belmont Lake State Park. The Bring Back the Pollinators project is focused on gardens in order to give visitors a close-up view and to learn about the native plants and pollinators. This work goes hand-in-hand with efforts by NY Natural Heritage Program (NYNHP) scientists to identify and protect the natural areas in parks which are key to supporting native fauna, including pollinators. Parks staff have also installed tall fencing around several gardens at Robert Moses State Park, Caleb Smith State Park, Heckscher State Park, and Orient Beach State Park to keep the deer from eating the showcase of flora and pollinator fauna. At Ganondagan State Historic Site, three projects will enhance habitat for native pollinators and other fauna. Staff has worked with NYNHP to identify plant species that are native to the area and that reflect similar natural communities known in the vicinity. Just as important is that the projects restore the cultural landscape of the Seneca town that was on the site over 330 years ago. The Oak Opening Habitat project is restoring a 60-acre old field to native grasslands to provide habitat for grassland birds, mammals, and pollinators as well as opportunities for historical interpretation. This spring, the grass seeds were sown and invasive species control efforts will continue through 2018. The restoration is based on the NYNHP rare Oak Opening community, which is known from a few places in nearby Monroe County. Ganondagan State Historic Site’s Oak Opening grassland restoration area. Photo credit: Kyle Webster, State Parks. The Green Plants Trail is the second project. It includes removing invasive species and replanting native plants to improve pollinator habitat and to feature a variety of plants that had and have cultural value to the Seneca people. A native bee pollinating a nodding onion plant along Ganondagan State Historic Site’s Green Plants Trail. Photo credit: Brigitte Wierzbicki, State Parks. The third project at Ganondagan, Pollinator Grassland, transformed a weedy 13-acre grassland into a tallgrass prairie by planting native grasses (such as big bluestem and Indian grass) and wildflowers (including common milkweed). These plants benefit pollinators and other native fauna. Native bee pollinating the milkweed plant at Ganondagan State Historic Site’s Pollinator Grassland. Photo by Brigitte Wierzbicki, State Parks. NYNHP staff is developing high quality banners and signage to promote the importance of native plants and habitats in State Parks and their role in supporting native pollinators. These materials will feature the partnership between NY Natural Heritage Program and State Parks and will be available for use at events, education centers, and other venues. In 2016, NYNHP displayed some draft posters to accompany activities at the New York State Fair, which stimulated many questions and compliments. Messaging, photo selection and design of banners and signage is under way using other funding sources and the professional fabrication of signage will be completed in 2017. This photo of a clearwing moth was posted at the 2016 NY State Fair to accompany activities on pollinators. Photo credit: Matt Schlesinger, NYNHP. Pollinators use a variety of plants and habitats from field to forest. Photo credit: Greg Edinger, NYNHP. The banners will describe how NY Natural Heritage Program is partnering with State Parks to protect habitat and learn more about what pollinators are present in NY – like this rusty patched bumblebee (Bombus affinis). Photo credit: LW Macior. The Council of Park Friends and a local garden club teamed up to plant a native pollinator garden along the side of the nature center at Clark Reservation. The project includes interpretive signs about the native plants, invasive species control, and how State Parks is helping to support native pollinators. Staff and volunteers at this park are creating a Sensory Awareness Trail. Along the trail, staff added NY native plants to attract native pollinators and to interpret the role these plants and pollinators play in our environment. The accessible trail includes tactile elements such as sculptures of insects/animals that rely on our native plant species. Volunteers plant native plants at Glimmerglass State Park during I Love My Park Day. Photo credit: State Parks. Local school students planted native plants at Saratoga Spa State Park to help provide food for both the federally endangered Karner blue butterfly (Plebejus melissa samuelis) and the state threatened frosted elfin butterfly (Callophrys irus). And at the Creekside Classroom, a new environmental learning center at Saratoga Spa State Park, a diverse mix of native plantings for landscaping and raingardens were installed. The underside of the Karner blue seen perched on the host plant, wild lupine (Lupinus perennis). Photo by Paul Labus, The Nature Conservancy, Indiana. Creekside Classroom raingarden will attract native pollinators and serve as a teaching tool for State Parks staff, photo by Casey Holzworth, State Parks. This summer, staff will convert four small lawns to wildflower meadows at Grafton Lakes State Park. The restoration will include planting native plants to attract native pollinators. Look for the work near the main entrance and near the new visitor’s center. This lawn along the main entrance road of Grafton Lakes State Park is being converted into a wildflower pollinator meadow, photo by Casey Holzworth, State Parks. State Parks’ staff worked with Renssalaer County Soil and Water Conservation District, National Resources Conservation Service, and Cornell Cooperative Extension to convert two cornfields at Bennington Battlefield to grazing pasture and a wildflower meadow. Work on this 26-acre project included tilling and seeding the area with non-invasive grasses and planting native pollinator meadows along the edges of the field and nearby wetlands. The pollinator meadows will be fenced off to keep grazing livestock out of those areas. Find State Parks pollinator program. Everyone knows that honey bees are great pollinators, but there are so many more insects and animals that are also pollinators. In recognition of Pollinator Week (June 15 – 21), we introduce some of our native pollinators. Each day from April to mid-October, millions of bees, butterflies, moths, wasps, ants, beetles and a few other animals pollinate New York’s trees, shrubs, wild flowers, and agricultural crops while they are feeding on the plant’s pollen or nectar. By transferring the pollen from one flower to another flower, the plant can produce seeds and fruits (fruit in botanical terms includes most of what we call fruits, nuts, and vegetables). Food for us and food for all the animals in the wild depends on this. In fact, pollinators help to maintain healthy and diverse flora, fauna, and ecosystems across New York State and around the world. Bees, like this Small Black Bee, are our premier pollinators. 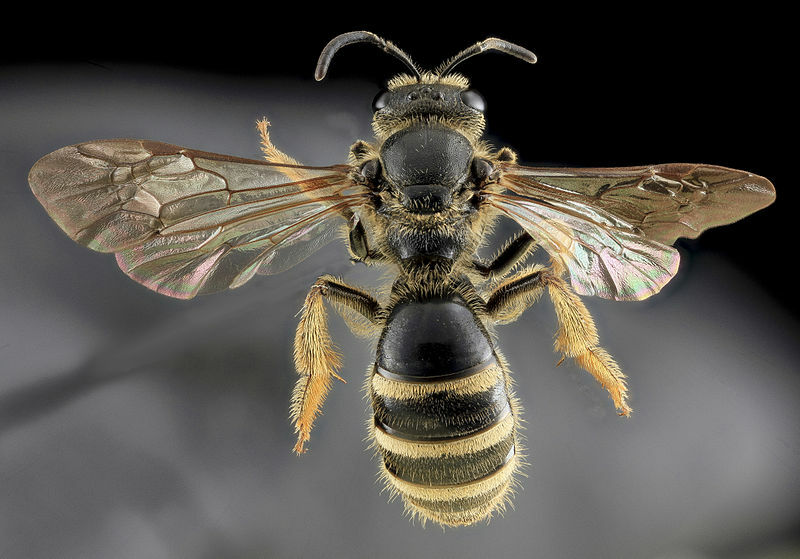 New York State is home to over 475 bee species. Bees like brightly colored blue or yellow flowers that are full of nectar and have a sweet or minty fragrance. By Sam Droege [CC BY 2.0 (http://creativecommons.org/licenses/by/2.0)%5D, via Wikimedia Commons. 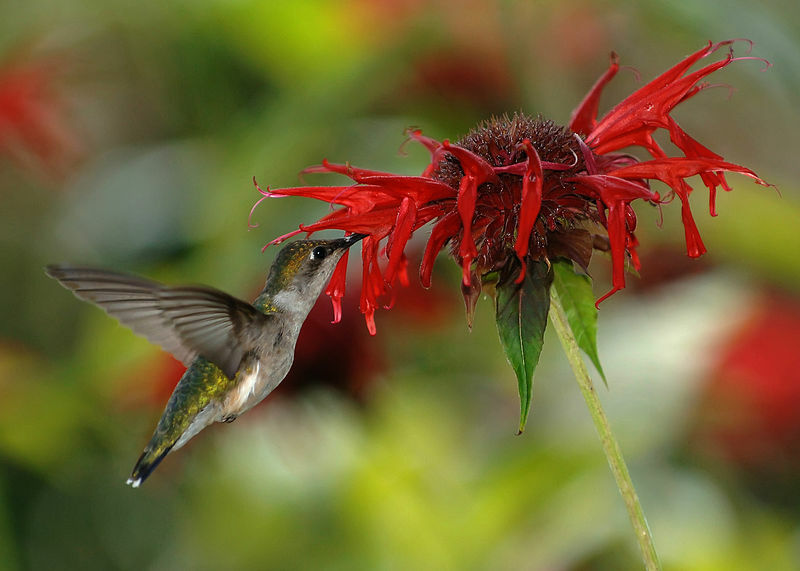 Ruby-Throated Hummingbirds like tube or funnel shaped red, yellow or orange flowers that produce a lot of nectar. By Joe Schneid, Louisville, Kentucky (Own work) [CC BY 3.0 (http://creativecommons.org/licenses/by/3.0)%5D, via Wikimedia Commons. 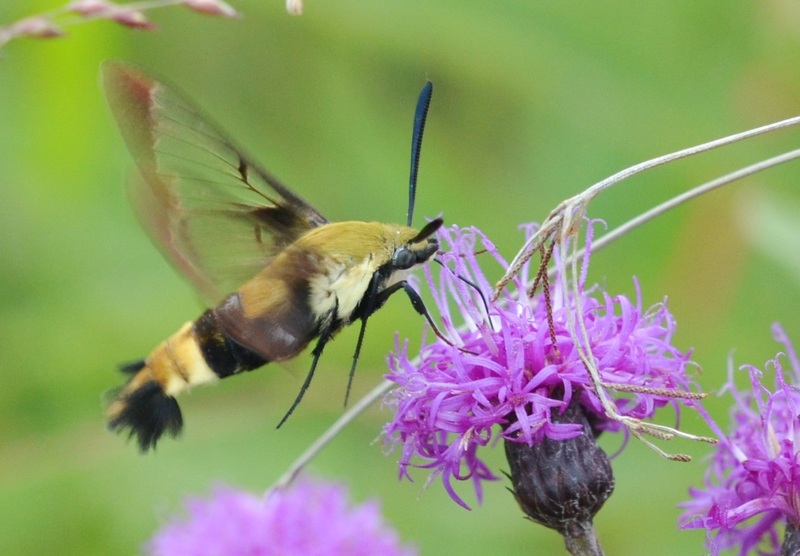 Look for moths like this Snowberry Clearwing Moth on white or pale flowers that open in the late afternoon or night or on dense flower heads like goldenrod. These large moths are often mistaken for hummingbirds. Both seek out plants that produce a lot of nectar deep within the flower. 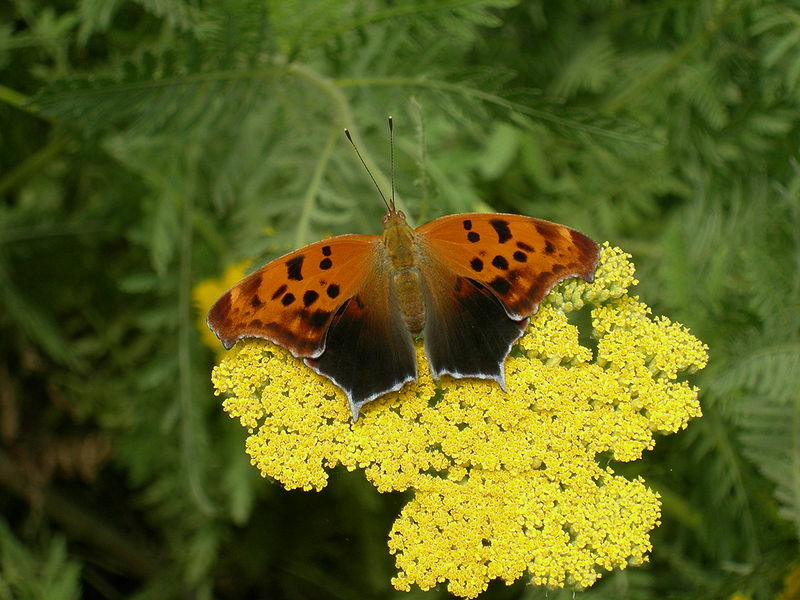 Like the Snowberry Clearwing Moth, this Question Mark Butterfly can also be found on flower clusters like goldenrod and yarrow (shown), and flowers that produce a lot of nectar deep in the flower. I, Jmabel [GFDL (http://www.gnu.org/copyleft/fdl.html) or CC-BY-SA-3.0 (http://creativecommons.org/licenses/by-sa/3.0/)%5D, via Wikimedia Commons. 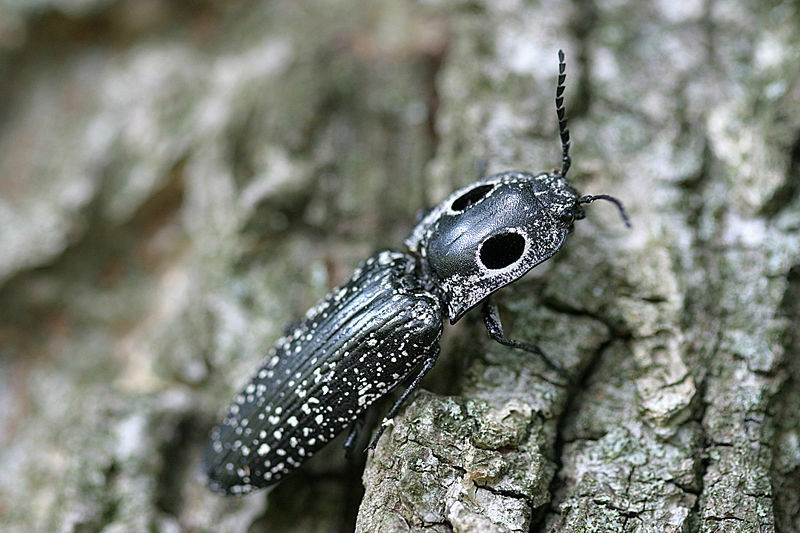 Beetles like the Eastern-Eyed Click Beetle rely upon flower smell to find flowers. Beetles especially like spicy and sweet flowers. By Henry Hartley (Own work) [CC BY 3.0 (http://creativecommons.org/licenses/by/3.0)%5D, via Wikimedia Commons. 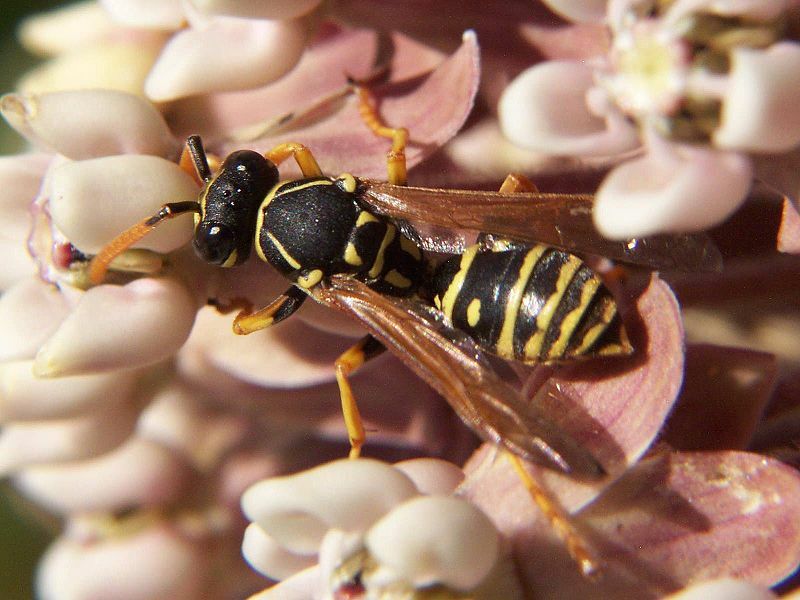 Although you might be a little wary of this insect, this Paper Wasp pollinates a variety of plants including milkweed (shown here), goldenrod, and fall asters. Many different kinds of wasps, including a group called the pollen wasps, are important pollinators. By Bruce Marlin [CC BY-SA 2.5 (http://creativecommons.org/licenses/by-sa/2.5)%5D, via Wikimedia Commons. Look for these pollinators and more during your next visit to a New York State Park! Post by Susan Carver (OPRHP) and Julie Lundgren (OPRHP/NYNHP).